Easy Dance Exercise for Seniors, Athletes and Kids – All in ONE! Learn to dance MUVE with "Hilo Hula." MUVE dance along videos teach free easy dance steps. There is no choreography to remember, taking the difficulty out of this easy dance exercise. There are 3 basic MUVES which you can explore at Method page https://muve.org/method.html. 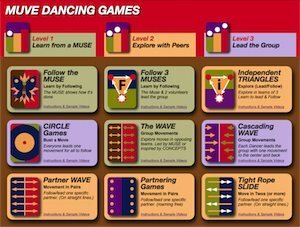 The Basic MUVES provide dance variations to exercise balance, direction, speed, size and intensity. These easy dance moves can get even the "non-dancers" into the dancing spirit. The Hilo Hula video displays the basic MUVE icons as well as instructions regarding optional speed changes. Learning about how to customize you own MUVES to your own needs is important because it makes it possible that elderly people, people in their physical prime as well as little kids can all enjoy dancing together to the same song, each getting the workout that fits their bodies. This easy dance workout is a good example for how one can slow down and speed up at will, when MUVE dancing. Dance along and practice the speed changes with us. Always adjust your own speed to make your dance feel great, that's one of the 10 MUVE Principles!